YND Lazy Mobile Holder For Sony Xperia MiroThis mobile stand can be used while you are lying in bed so that can relax and watch your favourite movies videos, chat with friends, browse the internet, without having to hold the mobile phone for hours?in your hands. It can also be used in your car when you just want to relax and watch that video. Just attach one side to your bed headrest or table using the clamp. Fix your mobile on the other end. With its 360 degree rotating axis you can set the viewing angel according to your comfort. This mobile bed stand even allows you and your loved ones to watch videos, movies and even browse the internet at the same time. This holder can hold phones upto 11 cm width. Hence its compatible with all phones including large size phablets. The length of the arm is 70 cms, excluding the clamp and the holder.Key Features • 70cm Long Gooseneck• Watch Movies Handsfree• Strong Clamp• Even holds phabletsSELFI STICK Wireless Mobile Phone Monopod with Shutter Remote Self-shooting--Best for Travelling. Suitable for iPhone with iOS 4.0 system or above/smartphone with Android 3.0 or above. Easy to take a self-shot without strangers' help. Photogragh and video yourself, wonderful everywhere! 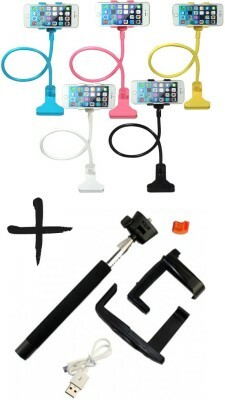 Using steps: ◆ Full charging monopod: 1 hou; ◆ Pairing customers cell phone and monopod (Bluetooth); ◆ Slip phone to clamp; ◆ Focus yourself; ◆ Push the button.